Illustrates the movements of General William J. Worth's division on August 20, 1847, during the Battle of Churubusco near the end of the Mexican-American War. Map of Genl. 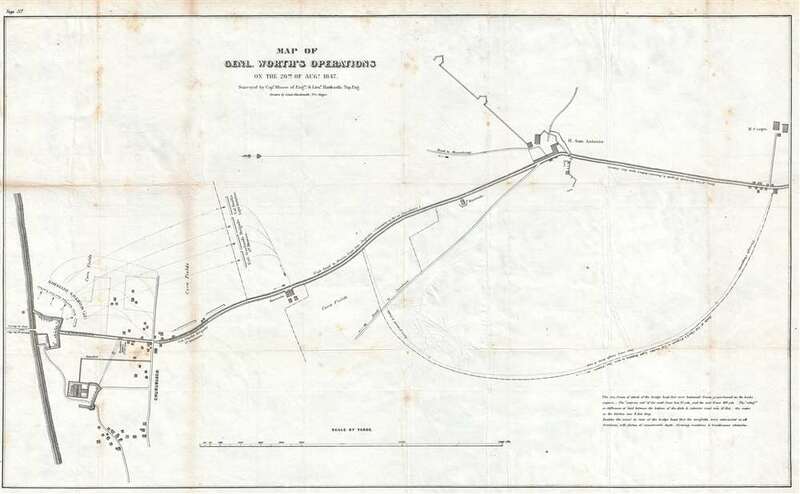 Worth's Operations on the 20th of August, 1847. This is an 1847 Edmund Hardcastle map of the actions of General William Jenkins Worth's division during the Battle of Churubusco which took place near the end of the Mexican-American War. Oriented towards the east, the map depicts the battlefield from the bridge crossing the Churubusco River to south of the Hacienda San Antonio, one of the key positions during the battle, and focuses on the road between Churubusco and San Antonio. During the battle, General Worth's First Division was tasked with two critical objectives: first, to drive the Mexican forces defending San Antonio out of their stronghold, and, once that was accomplished, to attack Santa Anna's troops at the bridgehead crossing the Churubusco River. Hardcastle's map effectively traces the maneuvers involved in both objectives, illustrating how two of Worth's brigades moved off the causeway leading into San Antonio in an effort to cut off the Mexican troops stationed there. However, Santa Anna's forces retreated before they could be surrounded, and set up a new position at the tete-de-pont on the south side of the Churubusco River. Here, Worth's troops attached from multiple sides and eventually drove the Mexico forces across the bridge and into a full retreat towards Mexico City. This map was drawn by Lieutenant Edmund La Fayette Hardcastle and published in a U.S. government report in 1847. Of the maps from this report that we have acquired, this appears to be one of the rarest, as it only appears in a handful of institutional collections and rarely appears on the private market. Edmund La Fayette Hardcastle (October 18, 1824 - August 11, 1899) was an American military officer, politician, and businessman. Born in Denton, Maryland, Hardcastle attended the Unites States Military Academy at West Point from 1842 - 1846, after which he was commissioned a Brevet Second Lieutenant in the Army Corps of Topographical Engineers. He was immediately assigned to the United States Coast Survey, but was soon transferred to participate in the Mexican American War. Hardcastle saw action I the Siege of Vera Cruz, the Battle of Cerro Gordo, the Skirmish of Amazoque, the capture of San Antonio, the Battle of Churubusco, the Battle of Molino del Rey, the Battle of Chapultepec, and the assault and capture of Mexico City. He was twice promoted for meritorious conduct on the battlefield, once after the battles of Contreras and Churubusco, Gand again following the Battle of Molino del Rey, attaining the rank of Brevet Captain. After the war, he held the position fo Assistant in the Topographical Bureau at Washington, D.C., and also was a member of the Mexican Boundary Survey from February 1849 until June 1852. Hardcastle finally received his formal commission as a Second Lieutenant in the Topographical Engineers on September 26, 1849. He then served as the Engineer Secretary of the Light-house Board at Washington, D.C. from October 1852 until April 30, 1856 when he resigned his commission. Hardcastle returned home to Maryland, where he began farming in Talbot County. He served on several boards and as president of the Maryland and Delaware Railroad Company in 1868. He also served as a member of the House of Delegates of the Maryland Legislature from 1870 until 1878. Edmund Hardcastle passed away at Towson, Maryland on August 11, 1899. Very good. Toning along original fold lines. Foxing. Some creasing. Close left margin. Blank on verso.